Now you can monitor critical conditions at remote locations without running wires. 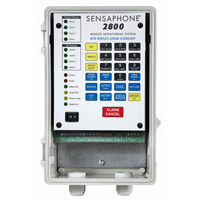 Introducing the new Sensaphone 2800 with Wireless Sensor Technology. Based on proven Sensaphone remote monitoring methods, the 2800 adds the ability to read sensor status from wireless sensors. And not just simple on/off status, or open/closed conditions. The Sensaphone Wireless Technology includes full analog capability so real world values can be monitored, like actual temperatures, real tank levels and flow rates. In addition to the wireless sensors, there are also two Wireless Interface modules. These allow you to connect to existing equipment or sensors and transmit their status back to the 2800 wirelessly. There is a Dry Contact wireless module, and even a 4-20mA wireless module. The 4-20mA wireless module even provides battery backed 24 VDC loop power for your transducer. Most of the Sensaphone Wireless Sensors run on batteries for up to 3 years. You can literally, just stick a sensor to the wall and start monitoring right away. The 2800 will scan, find the sensor, self configure and do most of the work for you. All you need to do is to record a custom voice message and fill in a few parameters. The Wireless Sensor Network is always being watched by the 2800. In addition to looking for alarms from the sensor values, it is also looking to make sure that each wireless sensor is fully functional and its batteries are full. If there are any problems with the wireless sensors, the 2800 will initiate a diagnostic alarm and notify the appropriate personnel immediately.